This is Joana! I hope you had a great Valentine's Day. I actually got to spend it with an amazing band, which totally surprised me! I had never been to their concerts (although I always wanted to), but friends had told me, that they were amazing and a lot of fun. 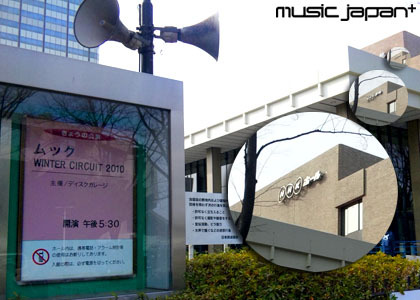 Therefore I was really excited about going to NHK Hall on February 14th for MUCC's first concert of 2010. Either way, despite all the things I had heard, seen and read so far, MUCC surprised me more than anything with their show! The sound was great and Tatsuro's voice is stunning, all the members were at their very best, and yet it was like nothing I had seen before. There was a very distinct feeling of art to the stage setting, the performance, the lights and the background scenes. The opening itself was so surprising, that my mouth stood open for a moment...a count down was displayed in green laser light letter on a screen veiling the stage, and when it opened a completely white and empty stage was bathed completely in red light. Five dark figures strode onto the scene from each side, distinctly carrying their respective instruments. The drum beats started at high pace and at that instant, bassist, vocalist and guitarist jumped down from stage and into the hall!! Of course everyone screamed in surprise! But for everything else, I hope you come and check back in our special features+!